Parking technology firm Frogparking has appointed two new senior sales executives to lead its ongoing expansion into the United States off the back of a multi-million investment. The New Zealand-based firm, a pioneer of cloud-based parking management solutions, has recruited Grant Johnson, a senior sales consultant in the parking industry for over 20 years, and Shaun Donaghey, who’s led a number of technology companies expanding their operations in the US. Frogparking Managing Director Shareena Sandbrook says the firm is building on its successes in the US aggressively boosting its research and development capacity and its international sales and marketing presence in the country. “With a number of successful sites and happy customers, Frogparking already has a strong foothold in the United States. Our well established brand and reputation gives our new sales team a strong base to work from in the US,” says Shareena. 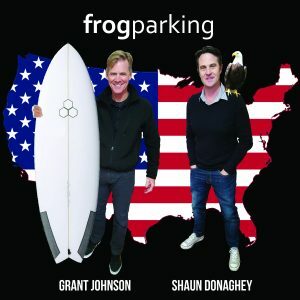 Grant, who’s based in California, says he has seen the industry undergo a technological revolution in his 20 years as a sales consultant and sees Frogparking as a future-focused innovator. Frogparking’s suite of solutions includes wireless indoor and outdoor guidance solutions, solar and hybrid occupancy sensors, cloud-based management and user apps with Bluetooth user engagement. Grant says one of Frogparking’s most sought after solutions is wireless indoor and outdoor guidance, which is fast to install, integrates easily with any existing system and delivers a smooth, stress-free user experience. “Parking is the first interaction people have when they go to a shopping mall, stadium, or an airport where the facility is likely to be large and very busy, with available parking at a premium. Both Grant and Shaun will be exhibiting Frogparking’s range of indoor and outdoor solutions for airports at the upcoming annual ACI-NA Conference and Exhibition in Fort Worth, September 17-20.